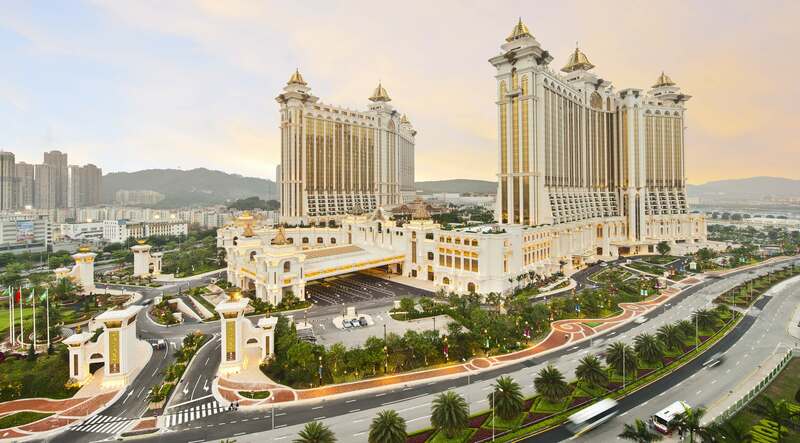 Teledex E Series hotel phones have been selected for the new Galaxy Macau Phase 2 expansion. New hotels included in the Galaxy Macau complex include the 1015-room JW Marriott, expected to open May 27, 2015, and the 254-room Ritz-Carlton, opening in August 2015. The phone of choice for the Phase 2 expansion is the Teledex E203 two-line analog cordless speakerphone, which was selected for both the JW Marriott and Ritz-Carlton hotels. “Teledex E Series hotel phones deliver the features the Galaxy Macau needs for its guests and delivers a perfect combination of utility and style, says Tony Xu, Vice General Manager of Sales, Cetis Greater China. “The Marriott and Ritz-Carlton hotels may program the E Series guest service keys to instantly dial for hotel amenities, and the customized faceplates match the property’s brand identity,” he adds. According to Derek Cheong, Senior Manager of Networks and Telecommunications, Galaxy Macau, “Reaching a final decision on phone sets took some time, however, through our repeated comparison, we selected Cetis from among many competing hotel phone brands. The reason we chose Cetis is that they are the most recognized and popular brand in the field of hotel phones, and because Cetis phones were also deployed at the Phase 1 of Galaxy Macau where we were very satisfied with Cetis products and services. Furthermore, we prefer the design appearance of E Series which is quite exquisite and a perfect complement to the style of our hotel guest rooms,” he concludes. E Series cordless hotel phone. Originally designed to meet the limited space and energy requirements aboard cruise ship cabins, E Series micro-footprint phones are 40% smaller than standard guestroom phones, saving space on the desk or nightstand and requiring less material – resulting in a more eco-friendly hotel phone option. E Series hotel phones are available in single and two-line, analog, VoIP, corded, and cordless configurations. Engineered specifically for hospitality applications, E Series phones feature patented OneTouch voicemail technology for hands-free auto-dialing and retrieval, up to 12 guest service keys, and customizable faceplates. Each cordless base unit supports multiple RediDock remote cordless handsets in the room. Teledex AutoSync technology automatically syncs RediDock remote handsets with the base and helps reduce hotel maintenance staff time to switch out handsets for rotation. Click here for additional Teledex E Series product details and photos. Colorado Springs, CO, March 10, 2015 – Four Sheraton hotels in Russia by Starwood have chosen Teledex I Series cordless and corded VoIP hotel phones for installation. Sheraton Sheremetyevo, Sheraton Rostov-on-Don, Four Points by Sheraton Kaluga, and Sheraton Ufa chose Teledex I Series phones for all 970 guest rooms. Selected Teledex I Series models chosen for the hotels include the NDC2105S single-line VoIP cordless speakerphone and matching RediDock remote handset kit, and ND2105S single-line VoIP corded speakerphone in Black. 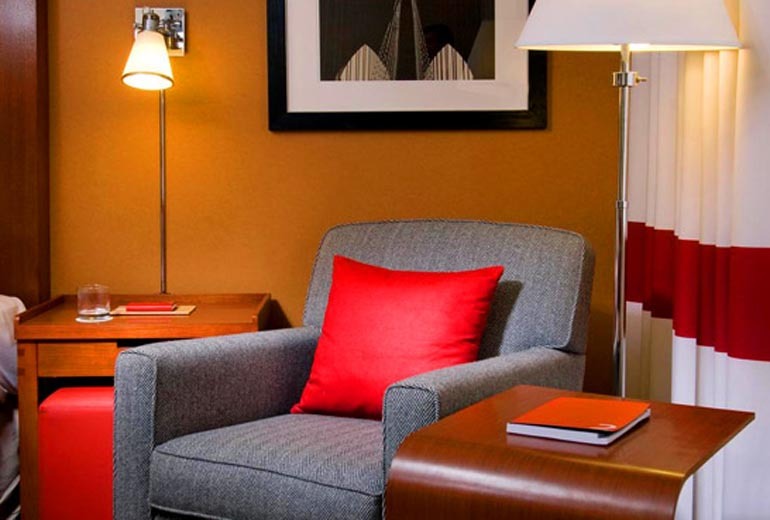 The hotels, owned by Starwood Hotels & Resorts Worldwide, participate in the Cetis National Account Program, which specifies hotel phone models for brand consistency across locations. Four Points by Sheraton Kaluga is scheduled to open May 1, 2015. Sheraton Ufa will open June 1, 2015 and Sheraton Rostov-On-Don on October 1, 2015. Click here for additional Teledex I Series product details and photos. Visit the new Cetis website at www.cetisgroup.com. 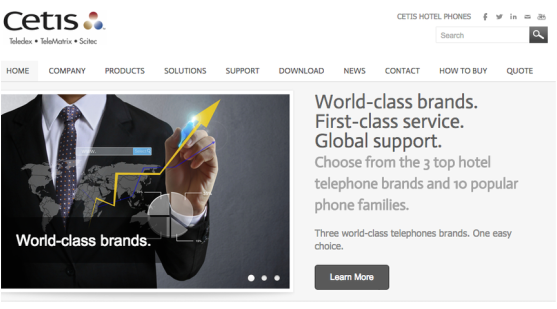 We have recently launched our new Cetis website at www.cetisgroup.com to better connect you to Cetis and our three world-class Teledex, TeleMatrix, and Scitec brand hotel phones. The website features a bright new look and improved accessibility to view and download product and support documents, resource tools, product images, news, and videos. It also serves as a convenient portal for communications with the Cetis sales, support, and marketing teams. Refer to the Contact page for important contact details, or complete one of the many forms embedded in the website to receive quick responses to your questions, comments, quote request, or how to buy inquiries. Be sure to click on the social media icons to connect with us on Facebook, Twitter, and LinkedIn. We would certainly like to hear from you. If you have any comments or suggestions regarding the new Cetis website, please write marketing@cetisgroup.com. We look forward to connecting with you! Hotel Investment Tops $30 Billion in 2014; Average Per Room Cost was $156,002, up 20.6% YOY. March 9, 2015, Portsmouth, NH – Lodging Econometrics reports that In 2014 total investment in the lodging industry was an estimated $30.8 billion. Of the 1,292 hotels that were transacted 935 reported a selling price into the public domain. The average selling price per room for those hotels was $156,002, up a dramatic 20.6% Year-Over-Year (YOY). The healthy increase in selling prices is due to record-setting hotel revenues and profits, low interest rates and the availability of attractive financing terms. LE foresees selling prices continuing to accelerate for the next several years as hotel performance continues to shine in the absence of any significant new supply. A critical part of the equation is that interest rates, although expected to rise, still remain attractive causing competition to intensify for prized single assets and portfolios. In 2014 a total of 1,292 hotel assets transacted or transferred ownership. Since the bottoming in 2009 of 528 transactions, total transaction volume over the last five years has ranged between 1,261 and 1,457 hotels. It is a narrow range far distant from the 3,218 transactions and transfers reported in 2007. In 2014 there were 799 single-asset transactions and another 481 hotels that changed ownership as part of a portfolio sale. A mere 12 hotels were recorded as part of merger activity. It is thought that any significant industry-wide consolidation of companies and brands may still be at least two years away, after the expansion phase of the current real estate cycle concludes and the maturity phase begins in 2017. Click here to read the story at Hotel-Online. Teledex M Series Bluetooth speakerphone with OneTouch voicemail retrieval. Hotel phones are a source of convenience for guests. Patented Cetis OneTouch™ voicemail retrieval technology is a standard feature available on Scitec, Teledex, and TeleMatrix one and two-line speakerphones that effectively eliminates calls to the front desk from guests who are unable to access their voicemail messages. 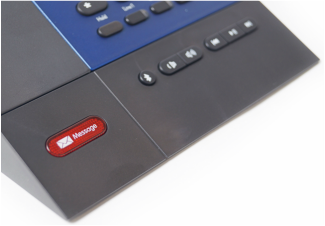 A single touch of the blinking red voicemail key auto-dials the guest’s voicemail, giving guests the ability to check their messages hands-free. And because it is intuitive, and easy-to-use, OneTouch™ voicemail also encourages guests to utilize the guest service keys on the in-room telephones, which can generate increased telecom-related revenue for hotel properties. Click here for additional details. Choose from the three leading hotel phone brands in the world, including Teledex, TeleMatrix, and Scitec. 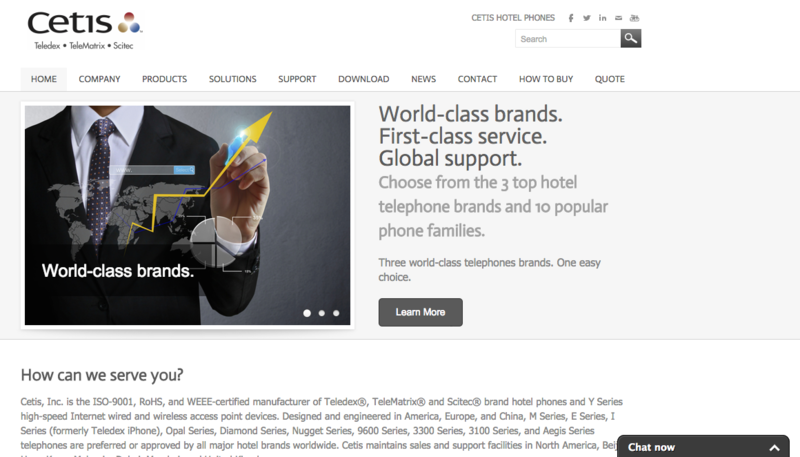 Cetis hotel phone brands are known and trusted in the hospitality industry. They are are preferred or approved by major hotel chains worldwide. Cetis hotel phones have a demonstrated record of reliability and in-service performance. As a proven hospitality industry supplier, Cetis helps eliminate quality and performance risks that could be associated with purchasing hotel phones. What to do if you lose your mobile phone? Do: Change the passwords for any accounts saved on your cell phone, ex. banking apps, social media. Don't: Rack up a bill. Have your service provider freeze your service, so no one else can make calls or hijack your data.